He had a long and distinguished career with Chelsea long before he ever arrived at Burnley, but for our fans the name of Ian Britton is one that will be remembered for ever in the history of our club. Britton scored ten league goals for the Clarets during a three year stay at Turf Moor, but it was the third of those ten, scored on 9th May 1987 against Orient that turned him into one of the biggest heroes we've ever had. The Dundee born Britton was just ten days short of his 33rd birthday but it was Chelsea where he started his career as a youngster having previously played for Hillside Rangers. He made his debut in the Chelsea side in December 1972 and over the next ten years made over 260 league appearances for them, scoring 33 goals. It was an up and down time for the London club. He played in the side that was relegated in 1975 but was a regular by the time they were promoted again two years later. However, Chelsea went down again in 1979 and they remained in the old Second Division during the remainder of his time at Stamford Bridge, which came to an end in August 1982 when he returned to his home town and signed for Dundee United. It coincided with their best ever season as they became Scottish champions for the first time in 1982/83 with Britton a regular, but he remained with them for just a season and a half before heading back to England to sign for Blackpool. Again the move came at the right time. He signed in December 1983 and a season and a half later was in the side that won promotion from the Fourth Division, swapping places with Burnley. A year later Brian Miller brought him to Turf Moor but such were the finances at Burnley that initially he was only able to sign on loan. Thankfully we were eventually in a position to make it a permanent signing. That 1986/87 season lurched from one disaster to another. Most will recall the embarrassing 6-0 home defeat against Hereford but there were far worse performances. Britton had scored in a defeat at Tranmere earlier in the season but his other two goals proved to be somewhat more important. He got our first in a vital 2-2 home draw with Torquay in the fourth last home game and then, three minutes into the second half, scored what proved to be the winner against Orient to keep us in the Football League. No Burnley team before or since has been in that position, and no player before or since has ever scored a more important goal, not even Wembley match winners Gary Parkinson and Wade Elliott. A year later he got his reward. Many of that side against Orient were released by Miller, and that was hardly a surprise, and Britton was the only member of that team to be in the starting eleven at Wembley a year later in the Sherpa Van Trophy. Leighton James was on the bench and the other goalscorer from a year earlier, Neil Grewcock, missed out with injury. 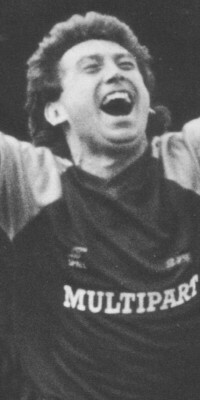 The 1988/89 season proved to be Britton's last at Burnley and his last in league football. He'd scored his first goal in a 2-1 defeat at Tranmere and in January 1989 he scored there again as the game ended with the same result. That proved to be Brian Miller's last game in charge. He was replaced by Frank Casper and although Britton remained in the side for much of the remainder of the season he was released at the end of his third year at Burnley. He brought his professional career to an end but was involved in local football after leaving the Clarets. He remained in the area where he still lives today and the scorer of our most important goal has now become a Burnley fan. He played a total 108 league games for Burnley, just about the same as he did for Blackpool, but over half of the games he played were for Chelsea. But Burnley is where Ian Britton will always be remembered.